Arguably Nashville Zoo’s signature species, the clouded leopard represents successful conservation initiatives including field research and captive breeding programs. Clouded leopards are listed as "vulnerable" and protected in most range countries although enforcement in many areas is weak. Precise data on clouded leopard population numbers in the wild is not known. The reduced number of pelts encountered at markets and reduced sightings of clouded leopards by people within its range suggest the species is in decline. Since 2000, Nashville Zoo has partnered with zoos around the world to develop collaborative breeding programs and field monitoring projects for clouded leopards in Thailand. 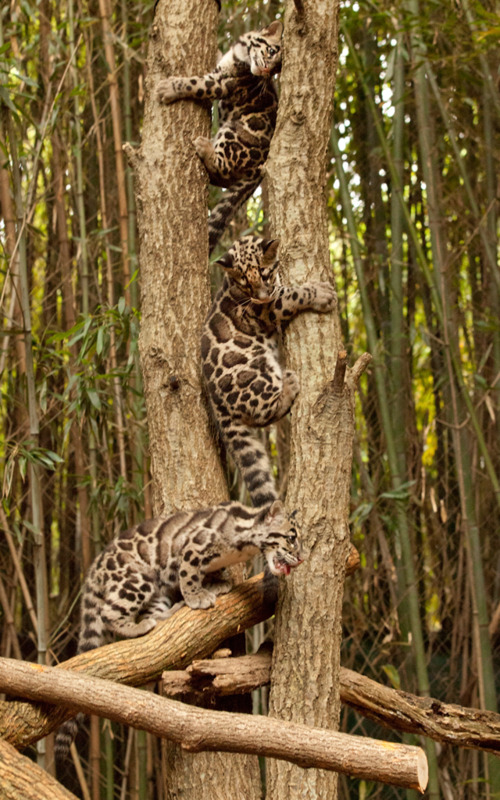 The resulting Clouded Leopard Consortium is based at the Khao Kheow Open Zoo with assistance from Thailand Zoological Parks Organization (ZPO), Nashville Zoo, Smithsonian's National Zoological Park, Point Defiance Zoo & Aquarium, and the Clouded Leopard Species Survival Program. Experienced clouded leopard managers from Nashville Zoo, Smithsonian National Zoo, and Point Defiance Zoo & Aquarium rotate duties to relieve a full-time project coordinator with the zoos funding salaries while they are working in Thailand. At Nashville Zoo more than 32 cubs have been born since 2009. All of our clouded leopard cubs are raised by hand. This technique prevents parental predation and allows this normally nervous species to become acclimated to the sights and sounds of human interaction typical in an exhibit environment. Hand-raising also allows the Zoo to pair cubs at an early age. Adult male clouded leopards are known to be aggressive to potential mates to the point of severe injury and even death. Our research with breeding clouded leopards has revealed that pairing at an early age significantly reduces aggression and allows for more successful breeding pairs.